The 17800B Recovers, Recycles, Evacuates, and Recharges R-12, R-134a, R-22, R-502, MP and HP Blends � and many more! � all in one fast, continuous operation through one hook-up. 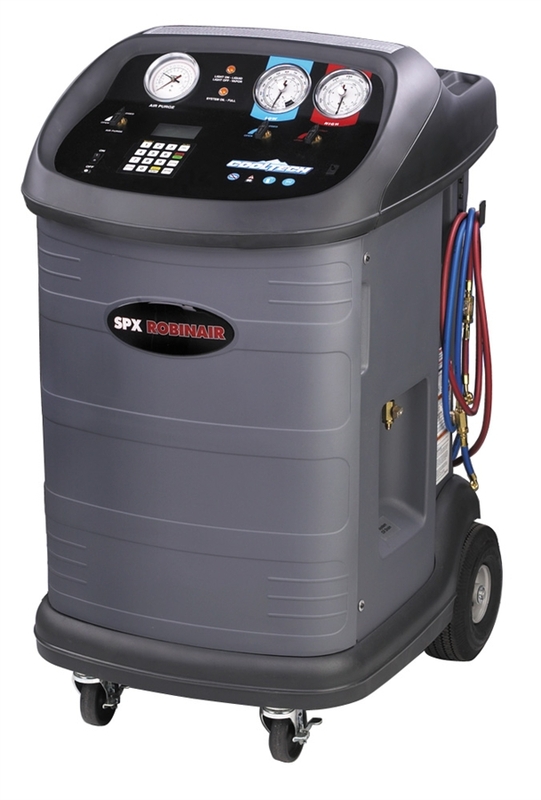 It�s ideal for refrigerated trailers, buses, RVs, and other vehicles that use more than one refrigerant. The CoolTech Multi is also great for fleet maintenance, covering a variety of makes and models since it has both R-12 and R-134a capabilities. In-plant maintenance departments will find it can handle the different types of refrigerants used in various systems. Microprocessor � Controls functions; prompts lead you through programming and also signal when it�s time to change the filter-drier, vacuum pump oil, and compressor oil. Float Chamber � Automatically adjusts from liquid to vapor for most efficient recovery. Electronic Scale � Makes it simple to recharge to factory specifications; also weighs recovered refrigerant and provides tank overfill protection. CoolTech Vacuum Pump � 6 CFM has the capacity to thoroughly evacuate the system, readying it for recharging. Versatility for many types of systems! Lockout Panel � Prevents mixing of refrigerants; rotates to one side for 1/4" fittings and to the other for 1/2" Acme fittings. Single-Pass Recycling � Makes an initial pass through the filter-drier.Multi-Pass Recycling � Additional recycling can be programmed in case of compressor burn-out, or other conditions. Heavy-Duty Filter-Drier � Removes moisture and acid from the refrigerant; can handle up to 200 pounds of recovered gas between changes. Comes with two 50 pound tanks, one with 1/4" fittings and the other with 1/2" Acme fittings. Three sets of charging hoses are included � one for R-12, one for automotive R-134a (with field service couplers), and one for other refrigerants using 1/4" SAE fittings.